External GPU Thunderbolt docks are *so* 2016. These PCIe x16 adapters will accommodate an MXM 3.x Type-A or Type-B GPU from either Nvidia or AMD for connecting straight onto a standard PC motherboard. While more and more manufacturers are scrambling to create eGPU docking solutions based on Thunderbolt 3, Eurocom has been looking the other way to create a hollow PCIe x16 desktop Riser Card for mounting MXM 3.x GPUs normally found on very high-end notebooks like the Eurocom Sky DLX7 or MSI GT72/GT75VR series. The goal is to enable users to easily utilize a laptop graphics card in a desktop or mini PC environment. Two versions of the Eurocom Riser Card will be made available designed specifically for either AMD or Nvidia MXM GPUs. 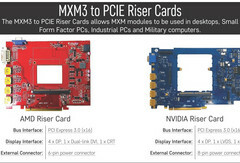 These cards will offer either 6-pin or 8-pin power connectors with multiple DisplayPort ports - features that are normally found on off-the-shelf desktop video cards but are otherwise missing on MXM video cards. Users can install up to the MXM GTX 1080 or MXM RX 580 and an included removable fan and heat sink will then sit atop the MXM card once it is mounted in place. 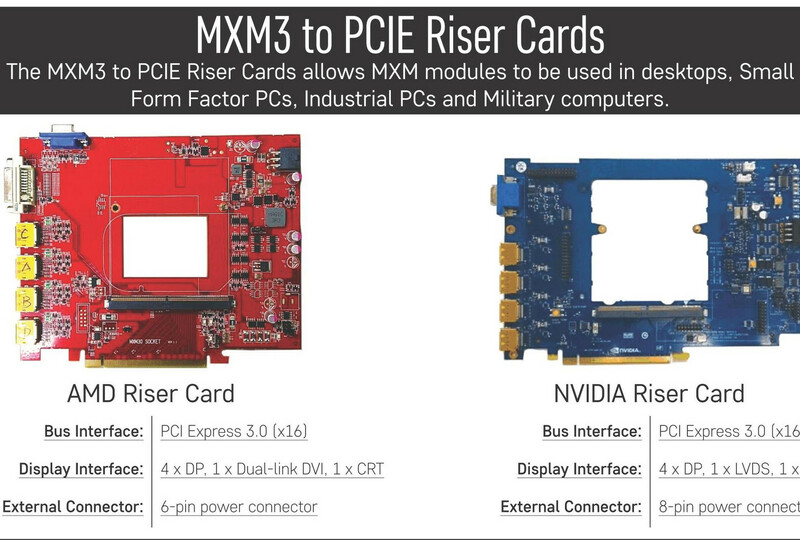 From a conceptual standpoint, the new PCIe x16 Riser Card introduces a lot of questions. Bandwidth shouldn't be an issue since PCIe x16 offers over three times the performance of Thunderbolt 3 (15.6 GB/s vs. 5 GB/s), but we're eager to see how the vBIOS will adapt to a completely new system that the original MXM GPU was never intended to synchronize with. Will the special fan be louder than a typical desktop graphics card? Will Turbo Boost performance be bottlenecked or even improved in any way? 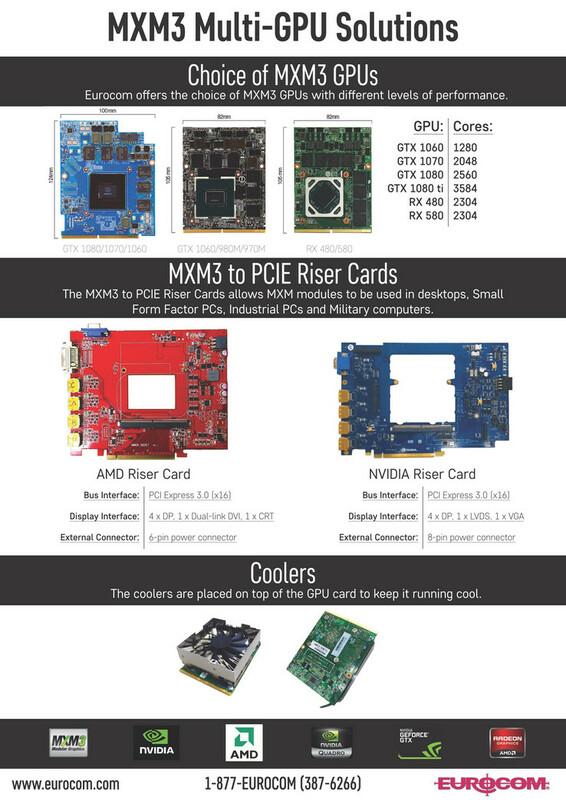 The market for such MXM to PCIe adapters is likely very limited especially considering that MXM graphics cards are not currently sold as standalone products. Similar unofficial adapters already exist from Chinese vendors, but we'll soon be testing the Eurocom product to answer all our burning questions. Release dates and prices will be made public in the coming weeks. In the meantime, see the official Whitepaper below.